Storefront from South Clark Street, Chicago, IL. The storefront viewed from inside the building. Upon arriving, you have the option of downloading the Amazon Go app, or using the QR code to sign in to Amazon through your mobile browser. I ended up downloading the Amazon Go app because it sends you receipts. Once you’re signed in to Amazon, a different QR code appears on your screen. You place your phone face down against a scanner to enter, which reminded me of walking into the Reg. The store itself reminds me of a corner shop rather than a fully fledged grocery store. Most of the items are packaged pre-prepared meals or grab-and-go snacks. Not pictured: one or two Amazon Go grocery workers who keep the inventory stocked. While Amazon Go is cashier-less, employees are still needed to stock the aisles and serve as a point of contact for customers. The store offers 7 cent bags that you can (voluntarily?) add to your total order amount in the mobile app. See it yet? Blended into the black ceiling are several cameras, which I assume are for closely monitoring exactly what you pick up, put down, put in a bag, restock, or put in a pocket. I didn’t do any rigorous testing of this technology (like taking an item of the shelf, putting it back, putting it in a bag, putting it back, putting it in a pocket, etc. ), but I imagine Amazon has really thought about all the possible edge cases here. More motion sensors appear to be placed on each shelf to catch whatever a camera might miss. I’m tempted to say those slits in the back of the wall are vents for the hardware, or airflow for the refrigerator, but they could also be additional sensors. La Croix were very popular with this store’s customers. I picked up the best drink known to man. And sure enough, the tech worked as promised. My receipt came through the Amazon Go App. There seems to be a lot of concern in the media that Amazon is looking to replace employee jobs with its software. While the model is cashier-less, there were about two employees while I was there. I think this is actually pretty standard for a small shop, although this would be a relatively low count for a larger grocery store (like Trader Joe’s or Whole Foods). I figured Amazon wanted to beta test the technology before transitioning it to Whole Foods. Front-stocked refrigerated aisles. In a typical grocery store, especially for refrigerated goods like milk, a sectioned off walkway behind the refrigerated aisles allows store employees to restock goods from behind the racks. 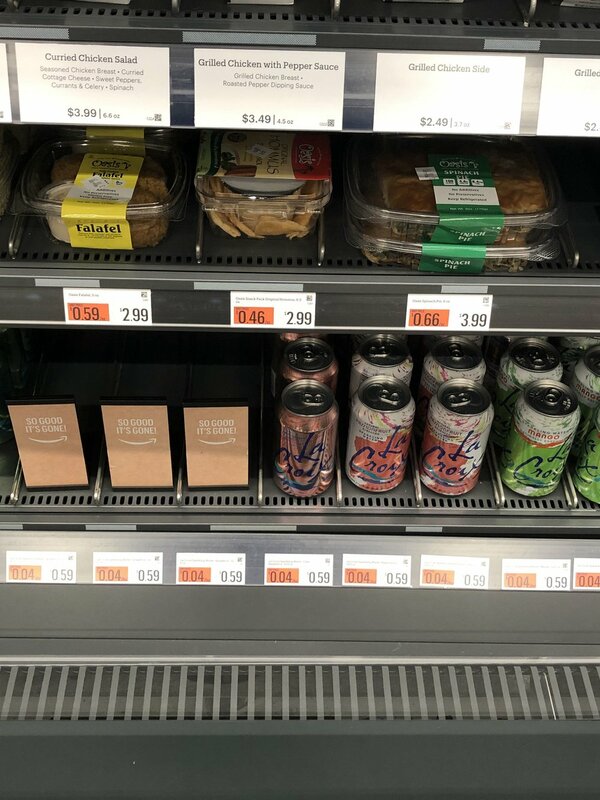 In Amazon Go, the store employees restocked goods from the front of the rack, standing in the same aisles customers used to browse goods. It’s still a frictionless experience, and in my opinion it’s actually good that the employees get to share the space of shoppers to help answer questions or concerns (or just to have human contact!). It’s just different from conventional grocery stores’ methods of restocking refrigerated items. It's the end of the workday, and the traffic's very bad, so getting to the store takes way longer than it should, and when you finally get there the supermarket is very crowded, because of course it's the time of day when all the other people with jobs also try to squeeze in some grocery shopping, and the store's hideously, fluorescently lit, and infused with soul-killing Muzak or corporate pop, and it's pretty much the last place you want to be, but you can't just get in and quickly out. You have to wander all over the huge, overlit store's crowded aisles to find the stuff you want, and you have to maneuver your junky cart through all these other tired, hurried people with carts, and of course there are also the glacially slow old people and the spacey people and the ADHD kids who all block the aisle and you have to grit your teeth and try to be polite as you ask them to let you by, and eventually, finally, you get all your supper supplies, except now it turns out there aren't enough checkout lanes open even though it's the end-of-the-day rush, so the checkout line is incredibly long, which is stupid and infuriating, but you can't take your fury out on the frantic lady working the register. And to think that we might be able to solve some of those daily annoyances? I’m excited about the prospects. From my short experience, the technology was seamless. I really would place my bet that this is the future of storefront grocery shopping. Disclaimer: This blog post was in no way sponsored or affiliated with Amazon Go, but if any Amazon employees are reading this and want to discuss strategic partnerships (especially involving Chocolate Nesquik), hit me up.